IGOR CHUDINOV, Prime Minister of Kyrgyzstan, said his country supported broader representation in the Security Council and had nominated itself as a candidate for a non-permanent seat for 2012-2013. Located in the heart of Central Asia, Kyrgyzstan was actively maintaining peace, security and environmental stability in the region and had been elected to the Human Rights Council in 2009. He said that the outlook for the complicated situation in Central Asia hinged on developments in Afghanistan, which required new approaches to the humanitarian, political and socio-economic sectors. In March, Kyrgyzstan’s President Kurmanbek Bakiev had unveiled the “Bishkek initiative”, which would create a centre for hosting international conferences on security and stability in Afghanistan and Central Asia in Bishkek, Kyrgyzstan’s capital. The initiative could become a forum of practical cooperation in the area of security, as the region fought terrorism, extremism, illegal drug trafficking and transboundary organized crime. As a landlocked, mountainous developing nation, Kyrgyzstan believed that the world community, under United Nations leadership, should use the foreign debt swap for sustainable development, he continued. For example, it could swap its debt in turn for aid for Afghanistan’s socio-economic development, a swap of debt for sustainable development of poor mountainous countries and rehabilitation of uranium tailing ponds. He urged Afghanistan’s neighbours with specific scientific, industrial and agricultural expertise to help in Afghanistan’s recovery. He noted that the Assembly had adopted several resolutions concerning mountainous countries, which contained an analysis of their socio-economic situation, as well as recommendations for assistance to help those nations develop in a sustainable manner. As an initiator of the resolution “Sustainable mountain development”, Kyrgyzstan would appreciate support for it at the current session. Regarding the environment, he said the numerous uranium tailing dumps, loaded with large volumes of toxic waste from uranium production and processes, were of great concern in the region. Those dumps were dangerous to health and the cleanliness of transboundary river basins and land. Kyrgyzstan constantly worked with other countries in the region to process international legal documents, which could curtail radiation pollution in the region. The Treaty on a Nuclear-Weapon-Free Zone in Central Asia, for example, entered into force on 21 March. He asked the nuclear Powers to support that initiative of the Central Asian countries and sign the protocol on negative security assurances. He noted that the high-level International Forum “Uranium Tailings in Central Asia: Local Problems, Regional Consequences, Global Solution”, held in Geneva in June, had been an example of regional cooperation. 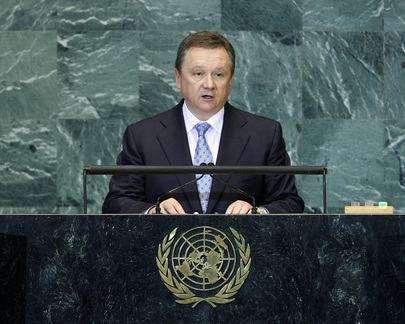 He praised the wide range of assistance provided by different United Nations entities and noted the success of the United Nations Regional Centre on Preventive Diplomacy in Ashgabat, created in December 2007.